Essex, a long time PSA Vendor partner, is now introducing the new IRox-T Turnstile Reader. 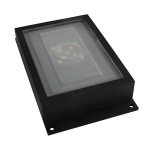 IRox-T uses the powerful embedded HID® iCLASS SE® technology that supports multi-frequency, multi-technology applications including SEOS, in a cost-effective low profile reader with enhanced read range capability. The IRox-T is designed specifically to solve concealment challenges that enables streamlined upgrades to higher-security turnstile applications including HID’s most secure SEOS technology The solution meets the ever increasing security demands in busy lobbies and other environments, without sacrificing functionality or speed. • Enables virtually all dual-frequency credential technologies including HID’s most secure Seos® credential for maximum security and use for multiple tenant applications. • Dramatically increases the read range for certified turnstile manufacturers. • Standardized using HID iCLASS SE reader module with an enhanced high performance read range and supports multiple frequencies and technologies including Prox, iCLASS, iCLASS SE and MIFARE, DesFire, EV1 & 2 for a variety of access control manufacturers. • Simplifies migration options to the highest level of credential security available today via HID’s Seos® credential technology. • Can be recessed or concealed with an increase in readability range. • Creates a streamlined replacement and transition from existing low-frequency readers to the latest, most secure credential technology available. • Increased read range contributes to a more efficient throughput for turnstiles.